This weekend, or last weekend? We really need Reidy to be playing. Not the greatest timing, but hopefully ok to play. We will soon find out anyway. Replacements (16-23): R Herring, A Warwick, R Ah You, K Treadwell, C Ross, P Marshall, D Cave, J Stockdale. Diack had a really good game last week and surprised he doesn't even make the bench this week. That said, it isn't good enough to turn up when it suits. Van der Merwe is a solid player, stronger than Diack and, with Browne, will help against a pack that will be out to bully us. Our pack is as strong as it can be without O'Connor, or Kane on the bench. Ah You was very poor last week. He's really going to have to step up. I agree. We need to try and tire their forwards out. A bit like we did v Saints. It was mentioned on their supporters site that some of their players looked tired by half-time. We really need to hold the scrum. We did ok last week, but for the last quarter. McCall did say that they were focusing on improving the scrum this week and, if Clermont has added more bulk, we will really need to get it right. If we can hold our own against their pack we have a chance. That's a huge 'if' though! Sin é wrote: No its not. Its ensuring that Ulster take the IRFU seriously. Yes, it is. There's nothing to suggest that Ulster don't take the IRFU seriously. I mean, it's not as though we don't practice good house keeping and pay back our debts. In fact, we are fairly debt free Anyway, your claim of 'payback' isn't believable. It's just Nucifora being a prat. Munster had to give up Paul Warwick, Mafi and Wian du Preez in the past. Leinster had to give up Isa Nawcea (who decided to retire rather than move to another european club). Paul Warwick is married to an Irish woman and had an Irish child at the time who suffers from cystic fibrosis. We had Mafi since he was a young lad - but as soon as he hit 30 he was gone. BJ hung on for a while on short term contracts. He has just qualified for Irish citizenship recently. Anyway, maybe Ulster could look to Munster to help them out - 2 SHs in Academy, 4 in the sub academy. Doubtful Munster will take them all into the Munster Academy. We don't need any of them we have our 2 best prospects, in the professional era, in our own junior ranks - Stewart and O'Donnell. Just when we get some real talent who would really benefit from coaching by a master of the position he has to leave. Munchkin wrote: Reading on another forum that Stockdale said Pienaar is leaving. Somebody in the know on another forum has highlighted some underage "excellent prospects" fro Ulster in the backrow - Matthew Crowther, Joe Dunleavy and Azur Allison. The last has a chance of being underage Irish captain. Yes, a very good result for Ulster. Exeter are out of it, and if Clermont beat Begles they are out as well. Still a lot to do for Ulster to qualify, starting with getting something out of the game tomorrow. Watching those final scenes at the Sportsground tonight where the Connacht team were absolutely euphoric after the game and there was a great pitch invasion with the fans staying and singing. Do enough of our players bleed Ulster, like Bundee bleeds Connacht? toml wrote: Watching those final scenes at the Sportsground tonight where the Connacht team were absolutely euphoric after the game and there was a great pitch invasion with the fans staying and singing. This is a question I have been asking myself. When I see some of the performances I honestly think some don't care enough, but then maybe the problem is with the coaching rather than the players? Foreboding conversation from earlier. This is total, utter crap. There is no interest in this team whatsoever. Back to business as usual for Ulster. Brainless, abject crap. Pete330v2 wrote: Back to business as usual for Ulster. Brainless, abject crap. Ulster are poor but the officials really dont help, being penalised for going into the side of a maul but Clermont arent even though the players told to get out? Clermont loosehead turning into the scrum and Ulster penalised? Then that lineout given to Clermont? That's what home advantage brings! Forget the referee, Ulster were just poor. Ulster were very poor in the first half. Yes Clermont were playing like demons and yes there were a few iffy decisions such as the forward pass for the initial try. Forward in my mind, flat for any French fans. However, we cannot blame anyone but our players for not being able to hold on to or catch a ball. The simple things were letting the guys down due to the massive amount of pressure Clermont exerted but professional players should be dealing with that pressure. If we were to proceed in Europe we'd have to absorb an awful lot more. It was great to see the second half revival but ultimately it was all for nothing with a huge mountain to climb. 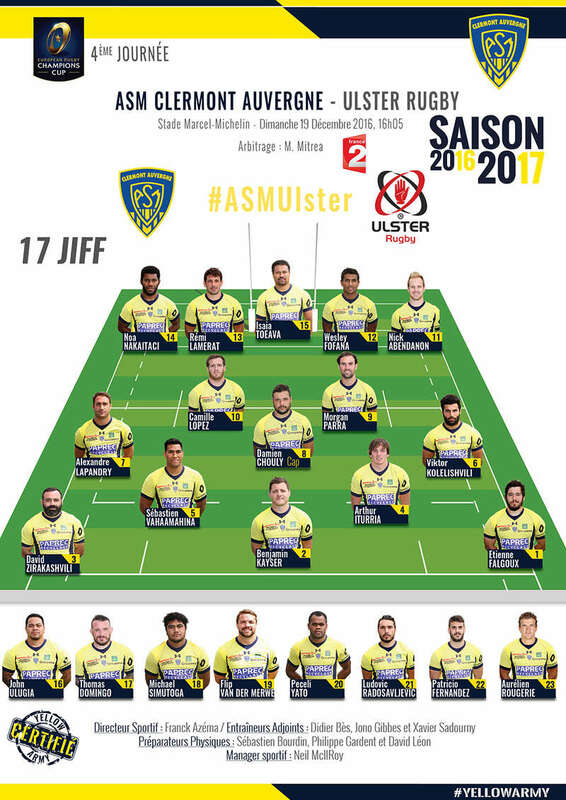 Back to the bread and butter stuff and the visit of Connacht, lets put on another home performance of Clermont crushing quality. That's the issue Marty - too many players are just shy of being top quality against sides that are brimful of them. Piutau stands out in an Ulster shirt - Toeava is just another name in the Clermont backline. Henderson was immense but would just be another forward at Clermont. I know of one player (at least) who wouldn't come to Ulster because of Clarke's reputation. The underage guys have their own grapevine that stretches across the provinces. Surprised to hear people describing Piutau as stand out. Personally I'm starting to feel like we aren't getting our value for money out of him. He's not making the breaks he did earlier in season, he's getting less out of his contact and bosh game, his ability to think about buys us time to get others closer to the breakdown, but he's not making any great strides of late. I also feel he backs himself 90% of the time even when the pass is the better option. Ludik for me has been impeccable. But ultimately our entire backline is up there with the best in Europe, but the pack is where we can't keep up. Clive is spot on you can have the best backs in the World, we don't but they are good, it doesn't matter if your pack doesn't front up . Other than Henderson and Best are forwards simply are not good enough, although to be fair the props have the potential. We are very very short of locks for next week it will have to be Henderson and de Merwe with Treadwell on the bench. No one else in the full squad or the academy fit. Looks like Greg Jones (Dublin born U-20 player ) is joining. With Gavin Thornbury probably signing as well have the players Leinster don't want become our main recruiting area ?? Angius Curtis the young 10 from SA will be with us next year been told it is a definite. So, who is our 9 going to be? Blade, Cooney or Heaney I reckon - which one though ?? Cave never had the pace to be top class. Marshall and Olding are converted 10s and it's questionable if their bodies are up to the pressures of midfield, but they would have had more caps except for injury. McCloskey doesn't look at full fitness but he would make a lot of Test teams. The backs can't play if they're getting smashed by opposition back rows, and that not only increases their risk of injury but reduces their chance to impress Schmidt. I can't help but think that the Ulster midfield (and halfbacks) looked a lot better when Williams was in the team as he had both power and pace to take some of the pressure off. Maybe Coetzee will rekindle that advantage whenever he gets fit but in the meantime Henshaw and Ringrose have the freedom to shine as policed by SOB, Conan, VdF, Heaslip, Ruddock, Leavy, Deegan etc. I did always think Henry was the best of our previous scrum half signings. That said, he ought never be anything more than squad filler. clivemcl wrote: I did always think Henry was the best of our previous scrum half signings. That said, he ought never be anything more than squad filler. 'The best use of a world class scum half is in clearing rucks as it covers up my inadequacies' alleged quote from a certain forwards coach. Just done the maths on European Championship. The results mean that Ulster will, probably qualify if they get 2 straight wins and almost certainly if they get a bonus point as well. Bottom line a 2nd place team is not getting out of that group if Saracens play to form. Bear in mind Exeter have nothing to play for and if Bordeaux lose at home to Clermont neither will they. Connacht are all but guaranteed 18pts so will go through. Ulster should get 17/18 pts with Bordeaux to come to Belfast. Munster have 2 tough away games but Racing have nothing to play for. I fancy all 3 to go through. I don't think we have a hope of winning it but qualifying would be seen as an achievement. Saracens and Leinster do the business at home to Toulon and Montpellier respectively. rodders wrote: Connacht are all but guaranteed 18pts so will go through. They are on 13pts with Zebre to play in Galway. Even if they lose to Toulouse they will finish on 18. Given Toulouse play Wasps at the Ricoh they could be done at that stage, Connacht could yet win the pool. Given there will likely be 5 pro 12 sides in the KO stages plus a Clermont side we have beaten already and that we are unlikely to get a home SF in the pro 12 we have the same chance in both competitions - an outside one. If that occurs it goes down to points difference I believe Connacht are over 30 points behind Toulouse and 50 odd behind Wasps. Don't get me wrong 5 points against Zebre should be enough but not certain, still need to avoid a tonking in France to be sure though. It's great to know that Kiss and his cohorts will have worked out a way to beat Clermont at the Marcel Michelin in April especially with the only available halfbacks being Shanahan and McPhillips.